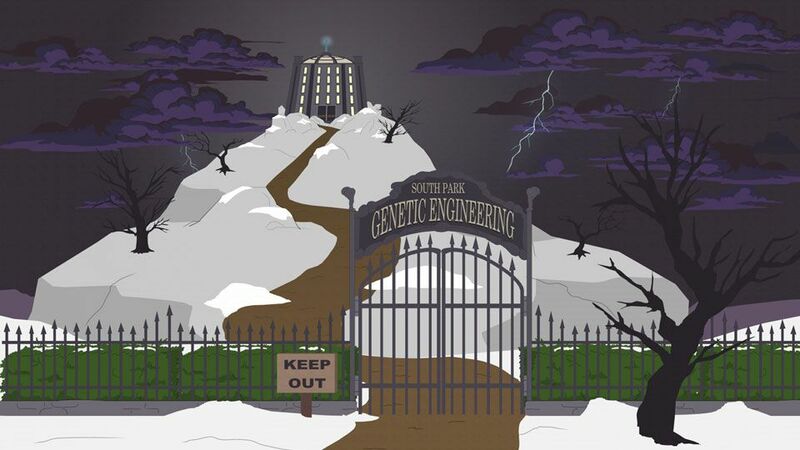 The workplace and assumed home of South Park's resident geneticist Dr. Alphonse Mephesto and his family, the multi-floor Genetic Engineering Ranch sits atop a massive hill just outside town. Dead trees litter the courtyard, with an imposing gate as well as a 'Keep Out' sign at the bottom of the hill, designed to scare away the ordinary and uninformed stranger. The genetics laboratory is a great place for genetically or surgically altering animals with multiple asses, while other modified animals and hybrids enjoy spacious enclosures. Despite the creepy atmosphere, Mephesto is happy to see friends and neighbors to assist them, and the ranch is open evenings for tours to the public. Throughout most of its appearances on the show, only one room is ever seen - a large entrance door leading to Mephesto's central laboratory, a large room with gray walls and blue floors, with a workbench for experimenting, often littered with microscopes and beakers of mysterious chemicals. A table for examining patients also sometimes appeared. The room also contained many enclosures where his animal creations are kept on display. A separate room of similar design was home to the Stan Marsh clone. The laboratory was re-designed in "201" to have a brown tiled floor and dull walls, lit by dim lights. Mephesto's workbench features a number of colorful display screens, with surgical tools closely available, and a small stool for him to sit on while working, with a small fluorescent light above the workbench area. A few animals are caged behind him, with a small tray for further creations. Animal experiments were now kept in cramped, well-lit yellow cages on a back wall between the entry area and the workbench. A doorway to an additional room is visible on the opposite end of the rooms seen. The large door now seems to be made from reinforced steel with multiple locks, likely to prevent escaped creatures. The Ground Floor contains a main area with a receptionist's desk near the main doorway, and a large public area similar to the Visitor's Center in Jurassic Park with many supervisors and a large central tank housing a multi-assed horse. A platform allows for guests to tour with Mephesto through a greenhouse area where genetically-modified plants are worked on. The Second Floor serves as the area for hybrid animal exhibits, such as Donkey-Apes and a tank for Bunny Fish, with large, naturalistic habitats for intimate study. The Third Floor is aimed towards applying Mephesto's genetic engineering skills for "helping humanity", and is primarily home to genetic mutations of his son and potentially other projects aimed towards these goals. The Final Floor was home to genetic experiments for a wealthy donor, including aggressive genetically-enhanced cats and sixth graders; however, these creatures are defeated during the game and therefore not permanent fixtures. The Gift Shop is seen only briefly, and is housed on the ground floor somewhere near the Greenhouse. No living space has ever been seen in the building. During the early seasons the ranch had a consistent exterior appearance, but it was given a complete facelift for its return in "201" to better resemble the more modern art design of later seasons, and this has been the consistent exterior since then. Although no living space has ever been depicted, the reclusive Mephesto family has never been seen living elsewhere in town, only appearing at the ranch, and they are thus assumed to also reside here. In a leaked early build for the game, the Genetic Engineering Ranch would have been located behind the Church within the Cemetery, where it would have appeared run-down and abandoned and been used by the Vampire Kids as a headquarters until they were defeated by the player. This level was cut from the final game. The ranch is visible from early on in the game, located northwest of the town, behind a broken perimeter fence in the woods west of Skeeter's Wine Bar and north of Stark's Pond, although the main gates are initially closed, leaving the actual ranch is inaccessible for much of the game. During gameplay, Freedom Pals and the player are tasked to visit the ranch to uncover the villain's efforts to have cats and his henchmen genetically altered. The level "The Many Asses of Dr. Mephesto", styled on a classic dungeon crawl, portrays the location radically different from the series, featuring it as a sprawling science facility with a wide, bustling variety of scientists, employed under the 'Mephesto's Tech' banner, with the interior visually resembling the Visitor's Center from the 1993 film Jurassic Park, and with Dr. Mephesto playing a role as a tour guide, holding tours every evening after dark. Mephesto explains that the science facility is funded by donors, including the villain, who has asked him to genetically alter cats and local sixth graders, boosting their aggression and number of asses, for his operation. When the complex security grid is turned off by the villain as an act of sabotage, the player is forced to lead the children and Mephesto through the facility to escape, killing many of his creations in the process, while Mephesto struggles with his own technological designs, including opening electirified doors. The player eventually escapes the facility, and can return to the main hall at any time to snap a selfie with him for Coonstagram. 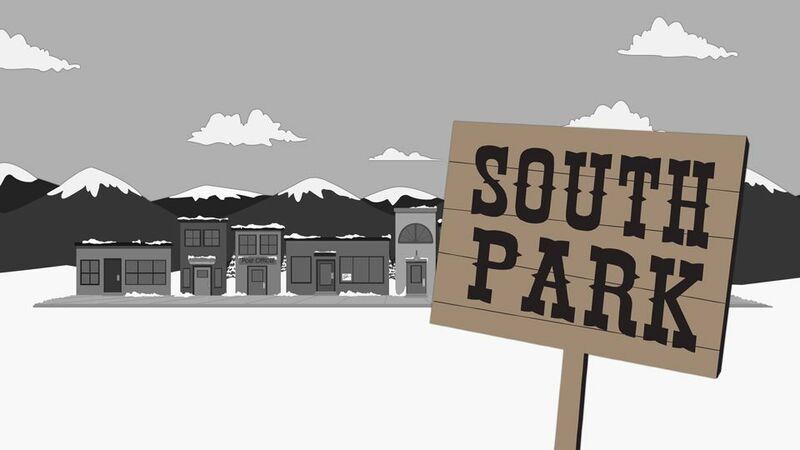 As Mephesto's ranch looks wildly different from the show, his assistant Kevin is not present, and his son Terrance's death conflicts with background appearances throughout the series, these scenes are presumably non-canon. The facility seems to return to its classic appearance by "South Park: Phone Destroyer", published by Ubisoft one month later. During the character creation process, Dr. Mephesto can be seen working in his laboratory in the background, with his sons occasionally walking past. In seasons 1-4, Bunnyfish are atop the gate, but since season 14, two asses fill the role instead. The main doorway has always opened to Mephesto's workbench area in the series, and has reinforced steel and locks in "201", but clearly opens to the main hall of a public research facility in the video game.